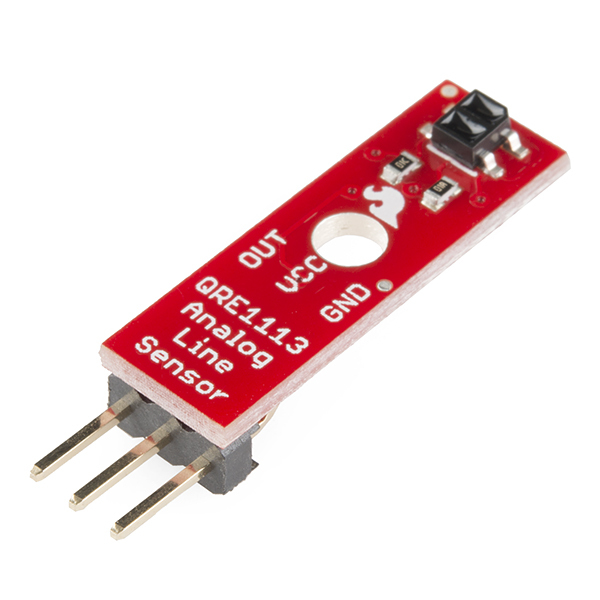 Hello, I have a bunch of these sensors and I hooked them up to my Arduino Uno. I have measured the voltage and the current drawn from the 5v source and I got these values: * Vcc = 4.94V * Icc (current through the Vcc line) ~= 36mA I have noticed that the back of the sensor, right beneath the optic cell, gets significantly hot. I have tried 4 different sensors and all exhibit the same behaviour. Is this normal? or should I get worried? Other than that, the sensor works as expected. Tested with different surfaces and different distances to the surface and it performs perfect. I was not able to measure the actual temperature with a probe but it feels pretty hot when I touch it with my finger. Double checked the connections, just to make sure all is good. That's not uncommon; it takes quite a bit of light to ensure a good reading out of these, which means quite a bit of current. It should never smoke or "smell hot" however. 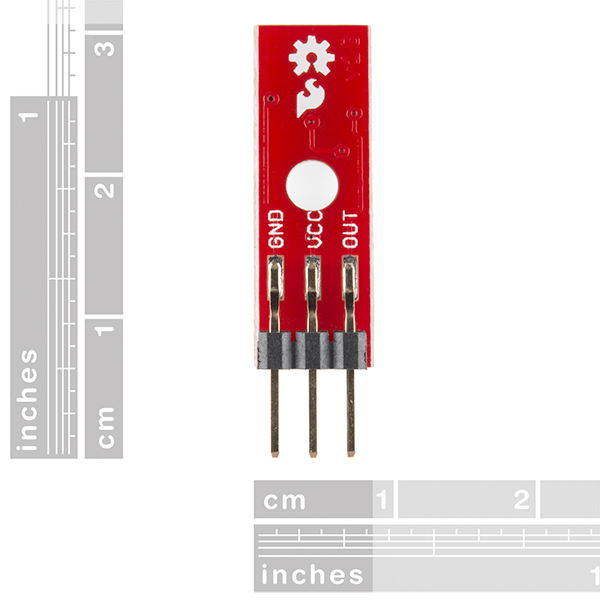 Will this product allow the redbot to follow light similar to a Solarbotics mousebot? 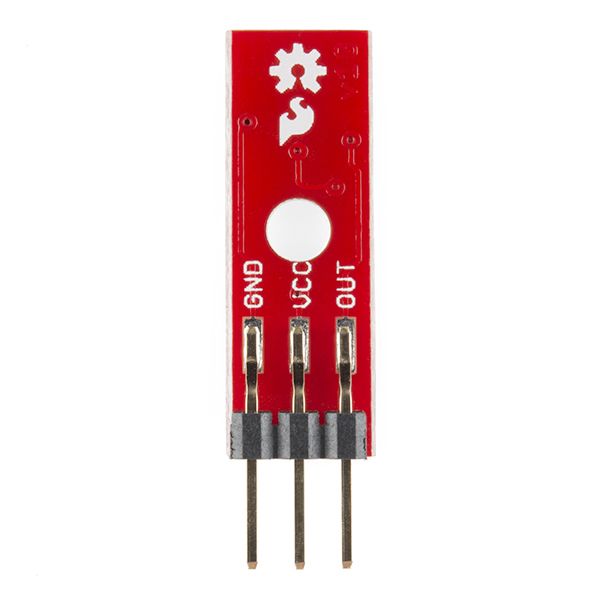 If not, what component would you recommend to allow the redbot to follow an intense flashlight beam? Would it be necessary to use a low pass filter in conjunction with this device in order to deal with the frequency of florescent light? So, if one were to put a stripe pattern on the inside of the wheel hub, or inside edge, you could use this as a motor speed sensor yes? Yes you could, since it measures reflectance changes caused by things such as pencils, pens, and markers. nothing really, just form factor. I've used this product in a number of automation projects. The Line Follower meets the K.I.S.S. principle that I strive for in my projects. It is easy to implement, performs as advertised, robust and is priced right. It works very well for us. We use it with our BoxBot robot. The student use a small piece of velcro to attach it to the underside of their robot. It is very small and light and we have had no problems with them at all. I used this on the bottom of my robot to find the black goal in a maze that was styrofoam green. Worked perfectly with a very simple analog read on the OUT pin. The only problem I could see is that it needs to be a constant distance from the surface (between about 0.5cm and 2cm). Changing the distance to the surface significantly changes the output. But your robot should not be bouncing up and down in line following scenarios anyway, so great product! I received a RedBot kit which was missing the line sensors so I bought these which normally come with the robot kit. They work great. They provide great detection between white and black surfaces. 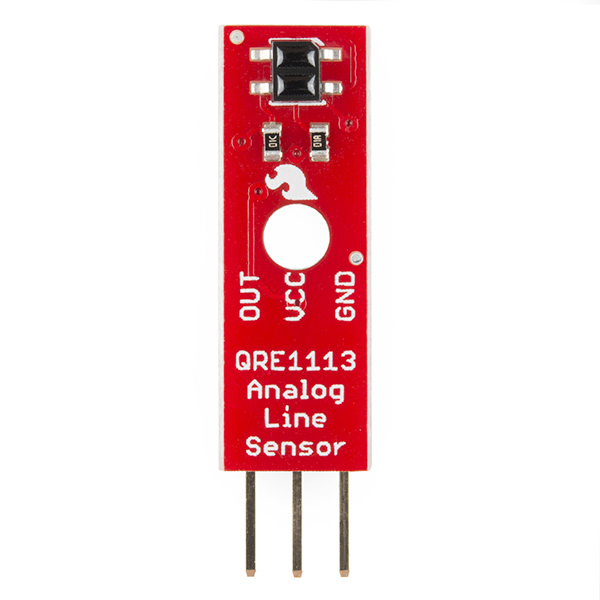 The kit calls for 3 sensors which is just enough to detect the line is present in the middle or crossing right or left. Works great. Used two on the robot to follow a line. I am using them to build a quadrature decoder. I have them pointing against a white disk with black lines done on a laser printer. I was afraid I was going to have to put a comparator on each sensor, but the natural logic levels of my receiving device (an ASIC) matches the outputs of the sensor. And I am pleased to see this product has a mounting hole! So many SFE parts do not :( Only issue is that a full size #4 washer comes awfully close to the 2 SMT resistors if you have the head on the fastener on the sensor side. Solution is to use a smaller OD washer.